In the twenty-first century, with safety paramount, deaths among RAF personnel have become uncommon. When one occurs it is given national media coverage, as evidenced by the fatal accident involving a Red Arrows display team engineer at RAF Valley in March 2018. It is true that information distribution is now far simpler, but the events themselves are that much rarer. This was not the case back in the 1920s when powered aviation was entering its third decade. At RAF Kenley, there were at least 16 fatalities involving personnel operating from the station in this period, including a member of the United States embassy staff. Most accidents went more or less unremarked, except for an entry in the squadron operations book or station diary. Occasionally, the passing of a colleague merited more attention and remembrance. One such is Pilot Officer Frederick Laing Collison. Farmer Frederick Collison was born in Essex in November 1898 and attended Brentwood Grammar School. On reaching eighteen, Collison was called up under the Military Services Act. Initially he joined 28th Battalion, The London Regiment (Artists Rifles), but on his Short Service Attestation of 11 November 1916 had expressed a preference for the cavalry or Royal Flying Corps (RFC). He passed the selection and medical process for becoming a pilot and was discharged from Artists Rifles on 14 July 1917, whereupon he was granted a temporary commission as a 2nd Lieutenant in RFC (List 73), effective 27 August 1917. After passing through the Officer Training Unit, he joined No1 School of Military Aeronautics in Reading where he received instruction in aviation theory, including map reading, gunnery and mechanics, with some practical activities such as taxiing and artillery observation; at this stage he had still not flown an aircraft. From here he moved to No.50 Training Depot Station where he would have received around 60 hours of flying training at both elementary and more advanced levels on Avro 504 and front-line aircraft. As a Flying officer, he was posted to France on 14 March 1918, joining No 2 Aeroplane Supply Depot at Fienvillers, fifteen miles north of Amiens. His role here would probably have been to ferry aircraft from the depot to frontline squadrons, his service record indicates short spells with numbers 8 and 10 squadrons. This period coincided with the German Spring Offensive which commenced on 21 March and resulted in a requirement to relocate the depot, as the front became more fluid. This relocation was completed by 31 March at Verton, six miles south of Etaples. The German offensive may account for his receiving a more permanent assignment when he was posted to No.2 Squadron at St. Omer on 18 April 1918. 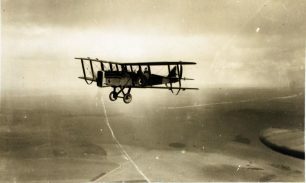 Number 2 Squadron was the first fixed wing squadron in the British military, having formed at Farnborough, Hampshire on 13 May 1912. It also had the honour of being the first British squadron the fly across the Channel to France on the outbreak of war. The squadron performed reconnaissance duties for the army throughout the war most notably flying the B.E.2 in a number of variants, as result it received the title “Army Cooperation” squadron. Little is known of the role Fred collision played with No.2 Squadron during his posting. 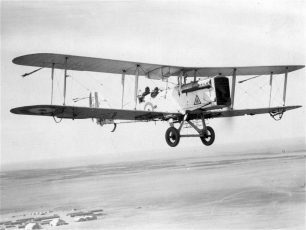 However, due to the serious situation on the Western Front, No.2 Squadron was heavily involved in supporting the British Army. Their sorties were a combination of offensive patrol, photography, artillery observation, artillery patrol and line patrol sorties. Unlike modern combat sorties, No.2 Squadron flew at heights between 1500 and 8000 feet, the lower levels leaving them vulnerable to ground fire. 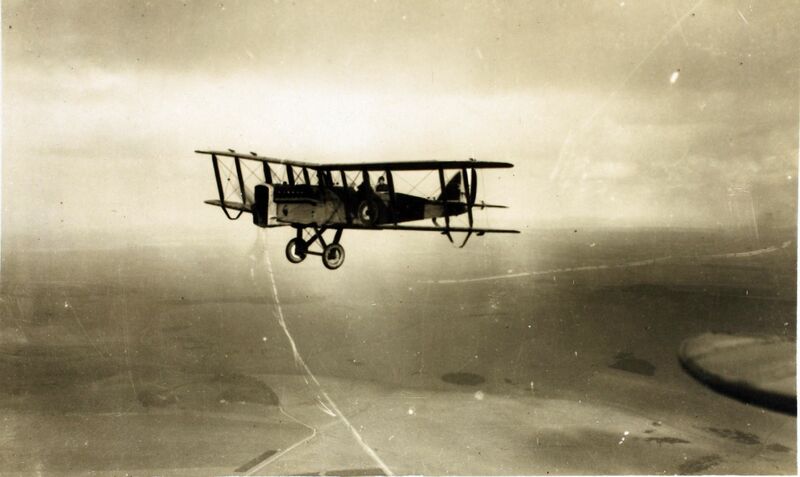 Despite not being a fighter unit, No.2 Squadron was regularly involved in combat with German aircraft as the allies first sought to stem the German attack and then moving on to the offensive which would ultimately bring an end to the First World War. Such aerial combat was an almost intimate affair with the opponents engaging each other at ranges from 200 down to as little as 20 yards. Flying Officer Collison’s posting to No.2 Squadron ended on 2 September 1918 when he was hospitalised as a result of injury. On 11 September he was granted four weeks leave and convalescence. On his return to active duty on 10 October, with the war rapidly reaching its conclusion as German resistance on the Western Front began to collapse, he was posted to two Training Depot Stations (numbers 36 and 43) in succession between 10 October 1918 and 28 May 1919. At these training Depot stations he may have received pilot refresher training or been involved as an instructor. In May 1919, he was transferred to the Unemployed List until 14 April 1921, due to the reduction in the size of the RAF at this time a large number of personnel were transferred here. The RAF in November 1918 consisted of 291,000 personnel and 22,647 aircraft; by the end of 1919 the force had shrunk to a strength of 35,500. 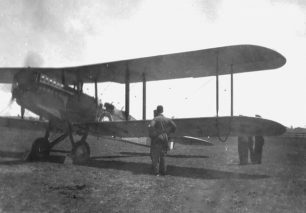 On 14 April 1921, Flying Officer Collison was restored to the Active List for Temporary Duty as a Flying Officer but only until 4 June of the same year. He is next recorded as joining the 4th Essex Regiment (a Territorial Army unit) as a 2nd Lieutenant on 1 September 1921, receiving promotion to Lieutenant on 20 January 1923. Flying Officer Collison had died one week after his twenty-eighth birthday. The esteem in which Frederick Collison was held by his fellow squadron members is reflected by The Adjutant and S.M. Vaisey attending his memorial service at Epping Old Church on 29 May 1927 where a memorial tablet was unveiled by Brigadier-General Calvin. He was obviously well regarded by his former comrades in 4th Essex Regiment as they presumably funded the memorial tablet. This is a brief rendition of the life of one airman who served in both the Royal Flying Corps and Royal Air Force. 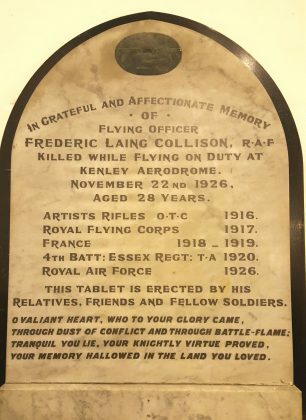 In the space of ten years Frederick Collison served in the Regular Army, Royal Flying Corps, Royal Air Force, Territorial Army and agan with the Royal Air Force. His tale is likely to be similar to many other airmen who died in service during the 1920s across many RAF squadron and training units. The rate of loss from accidents at RAF Kenley did not diminish as the 1930s dawned, with a similar rate of casualties occurring up to the outbreak of the Second World War. Between July 1920 and April 1939 there were 32 fatalities in flying accidents from the station. Today RAF aircrew losses are rare and exceptional and given wide coverage in the connected age, in the 1920s and 1930s such deaths would have received only local coverage.